President Donald Trump and Boeing are in the final stages of negotiating a multibillion-dollar deal for two new Air Force One airplanes, according to three people with knowledge of the discussions. Trump met with Boeing CEO Dennis Muilenburg at the White House on Tuesday to try to close stalled negotiations between the Air Force — which is responsible for buying the planes — and the aerospace firm, the sources said. Air Force leaders and Boeing have been negotiating the terms for the complex modification of the two 747 jumbo airliners that the military service bought from the company last summer. One person with knowledge of the deliberations described the negotiations as professional, but challenging. Among the sticking points is the type of contract the government signs with Boeing. The Air Force wants to sign a fixed-price deal that would require Boeing to buy the planes at an agreed price, and then eat any cost overruns. Boeing signed a similar contract with the Air Force for new aerial refueling tanker aircraft in 2011. That refueling plane has run into numerous development problems costing the Chicago-based firm about $2 billion. Trump and Muilenburg on Tuesday were able to break the gridlock that had stymied lower-level negotiations, the sources said. Although the deal has not been completely finalized, an announcement is anticipated soon. The new Air Force One project, then estimated at $4 billion, was thrust into the spotlight 14 months ago when Trump, as president-elect, criticized it as being too expensive. “Cancel order,” he tweeted in December 2016. At the time, the Air Force had only previously awarded $170 million to Boeing for preliminary designs. The result: in August, the Air Force inked a deal with Boeing for two 747-8 aircraft — newer, larger versions of the current Air Force One, which are 747-200 airliners delivered in the early 1990s. The Air Force said it got a good deal on the planes because Boeing built, but never delivered them, to a bankrupt Russian airline. Boeing, however, blocked the Air Force from disclosing the price of the deal, saying the aircraft are still being sold on the commercial market. 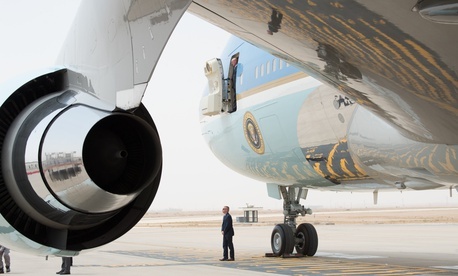 Soon after, Boeing and the Air Force began negotiating terms to begin the extensive modifications required inside the unique Air Force One aircraft, including conference rooms, a presidential office, and secure military communications that allow the president to stay in the chain of command and launch nuclear weapons, if needed. The Air Force’s fiscal 2019 budget proposal, released last week, projected the new planes costing $4 billion. While Trump has already claimed $1 billion in savings, the results of the latest round of negotiations will determine the actual level of savings, if any.